Explore the amazing Oberon High Country. High Country Trail Rides will let you explore the spectacular Blue Mountains High Country on horseback and quad bikes, ride beneath a canopy of pine forests, marvel at the unspoiled bushland, gaze into a crystal clear creek, breathe the clean mountain air. 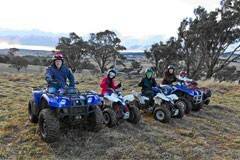 An unforgettable riding experience at Oberon NSW. If you are looking for a family holiday, we have just what you need. Farm Stay Cottage Accommodation is available on the property. Children are encouraged to interact with our friendly farm animals. We have rides to suit adults and children 6 years of age and up, the rides are tailored to each individual group, with big bikes for adults and small and medium sized bikes for the kids. The adults and kids over 12 can ride right to the top of the hills to enjoy 360 degree views of the surrounding country side. The smaller children ride in the lower areas where it is nice easy riding. There are always some friendly farm animals waiting for some attention on these rides. Full riding instructions and safety equipment are supplied to all riders. To find us, drive through Oberon, (from Sydney side), turn left onto Rupert St, then left on Abercrombie Rd. Drive for approximately 6 kms then turn right into Sloggets Rd. Drive approximately 4 kms, we are on your left. Oberon is approximately 2 1/2 hours from Sydney and Canberra (now a fully sealed road), 1 1/4 hours from Katoomba, 35 mins from Bathurst. Complete your details below and your enquiry will be emailed directly to High Country Trail Rides. Please check your contact details are correct to ensure the quickest possible reply.